After days of feasting and wine tasting, our souls needed replenishing. On our second day in Eugene, or Hippie City as I like to call it, we decided to head into the majestic Cascade Mountains east of Eugene to pristine Waldo Lake. I had read that this is one of the cleanest lakes in the world and when we arrived after the hour and a half road trip, the lake’s beauty was awe inspiring. The water, glistening in the sun, ranged in color from deep blue to sapphire and a light turquoise. Pine trees came to the edge of the lake and snow capped mountains could be seen far off in the horizon. But as we approached the shore with our picnic, we soon realized that not all was well at Waldo Lake. Bloodsuckers. I slapped a mosquito off my neck when I first stepped out of our rental car, but as we came nearer to the water the one or two skeeters quickly turned into a swarm. Every second we could feel them probing at any exposed skin. We retreated from the shore back into the forest, but were followed by the mosquitoes. As we trudged along back to the car, I was thinking to myself, “I am not going to be sent home by a bunch of parasites.” Then in the distance, I spotted an RV and possible salvation. The camp was that of the park’s friendly camp host who had an extra can of bug spray for us. He said in the spring the mosquitoes can be so bad that he doesn’t even leave his RV. After what we had just been through, I couldn’t imagine much worse. I was just happy to have some relief from the bugs. According to the informational signs at the park, Waldo Lake was carved out by glaciers and is the second largest lake in Oregon. Its incomparable clarity (at some spots you can see more than 100 feet below the surface) comes from the fact it is fed by snow melt and underwater springs. Little erosion on the shore means the lake doesn’t contain much sediment or nutrients that promote algae growth. Once we were done with lunch, we decided to take a swim. Although it was a little cold, swimming was just wonderful. The lake’s water felt clean and fresher than any other lake or river I have ever known. A friendly guy out with his kids let us borrow a couple of face masks and we spent some time paddling around and checking out the view under water. It was amazing, reminding me of when we went snorkeling in Hawaii. We swam out to a raft and just lay in the sun, feeling total relaxation. Later that day, we had dinner at a great restaurant in downtown Eugene at which we enjoyed a bottle of Lange Pinot. After dinner, we stopped at a new bar in Eugene called The Beer Stein. The place is a “bottle shop” and it was a new experience for me. Instead of selecting a beer from a menu, patrons instead pick bottles from the hundreds that in the store’s refrigerator cases. Then you take your bottles up to the bar where they will pour your beer into an appropriate class. I was astounded by the selection. Rauchbiers from Germany, Belgian Krieks and a great selection of domestic microbrews. Summer in Eugene is pretty quiet, and I was a little disappointed that all my old haunts from my days at the University of Oregon were pretty much deserted. The Beer Stein, however, was hopping. And not just with brew snobs, but with young college kids as well. It was just another example that Oregon is wine and beer country. The next morning we left in the morning for our return flight back to Sacramento. 1. Waldo Lake, pristine and wonderful. 2. Wine tasting in the Oregon countryside, not a snob in sight. 3. Pizza, really good pizza. On our second day in Portland we met up with some friends for lunch in the suburb of Hillsboro and reminisced about our days when all of us lived out on the coast in Astoria. 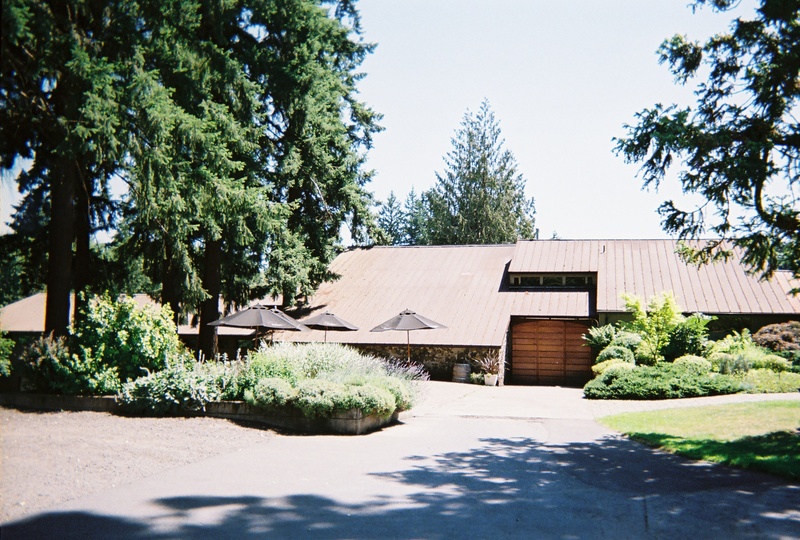 Hillsboro is located near the northern edge of the Willamette Valley wine country so after lunch Christine and I decided to visit a few wineries, including Ponzi Vineyards. The walls of Ponzi’s modern looking tasting room are decorated with the menus from various state meals, including a few White House dinners from the last three administrations, during which Ponzi was served. The weather being so pleasant Christine and I opted for buying a bottle of wine and heading outside to play bocce ball and sit in the shade. We decided to try Ponzi’s Arneis because neither of us had ever tried the varietal. 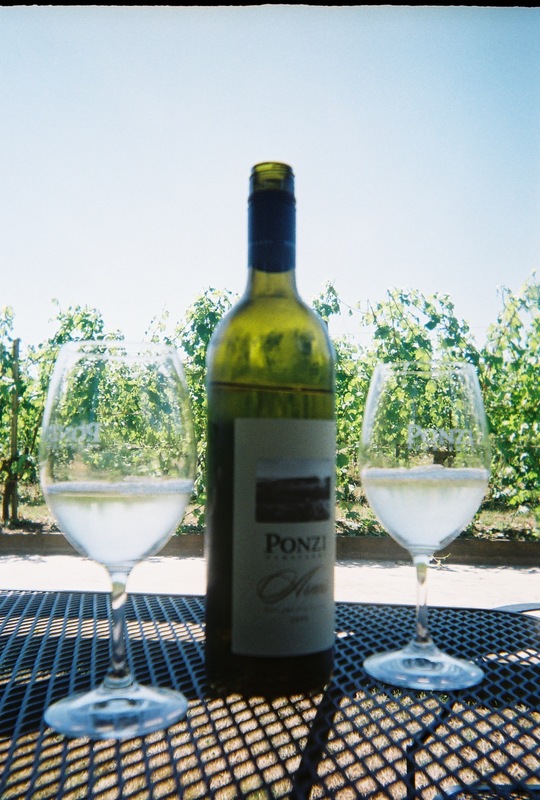 That’s not surprising as Ponzi is the only Oregon winery and one of only three wineries in the U.S. that makes wine from the ancient Italian grape. We purchased a bottle for $20 and headed out to the bocce courts that were framed by tall pines and vineyards. The wine displayed an interesting mix of fruit flavors and acidity and proved to be the perfect complement for a warm summer day. After some desultory rounds of bocce, Christine and I just decided to sit in the shade of our patio table’s umbrella and enjoy our bottle of wine. After a pleasant drive through the countryside back to Portland, Christine and I checked into our second hotel in Portland. She was able to score an amazing bargain on a room at the new luxury hotel The Nines. The hotel was a stunner. Beautiful rooms, wonderful amenities and a gorgeous restaurant located in the hotel’s sunny atrium. That night we decided on Henry’s 12th Street Tavern for dinner. The food was OK but the real attraction of the restaurant was its beer list with more than 100 choices. I was able to try a pint of the famous Dogfish IPA out of Delaware (that tasted a little odd, I’ll stay with my West Coast IPAs) and Christine tried a light wheat beer from Minnosota. 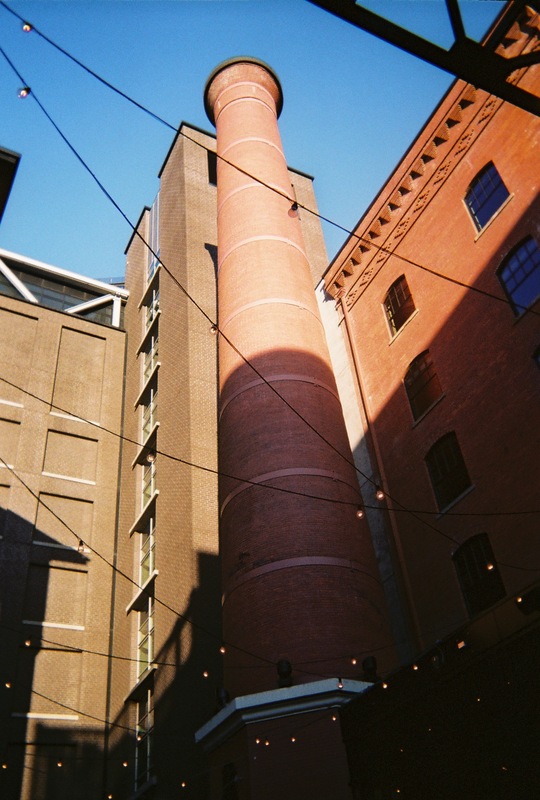 The place is located in the historic Henry Weinhard’s brewery and we snapped a photo of the brewery’s old smokestack. We spent the rest of the evening taking a roundabout walk back to our hotel and came upon a guy getting a grill started on the sidewalk in front of a jazz club. Intriqued, Christine and I ducked into the place and soon found ourselves listening to a wonderful jazz singer as wafts of barbecue drifted in off the street. I’ve lived in small towns almost my entire life and I’ve always loved the rural lifestyle. 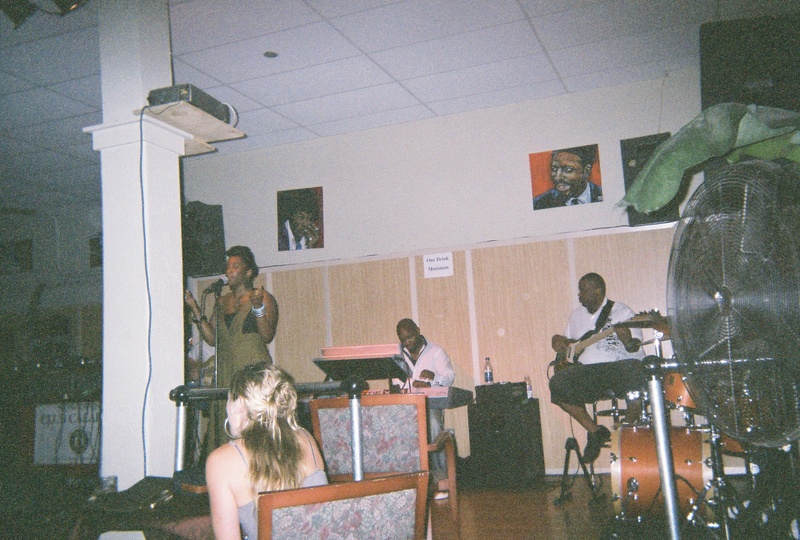 But as I sat in that jazz club listening to a soulful and passionate singer backed up by a wonderful band, I could see the benefits of a living in the big city. 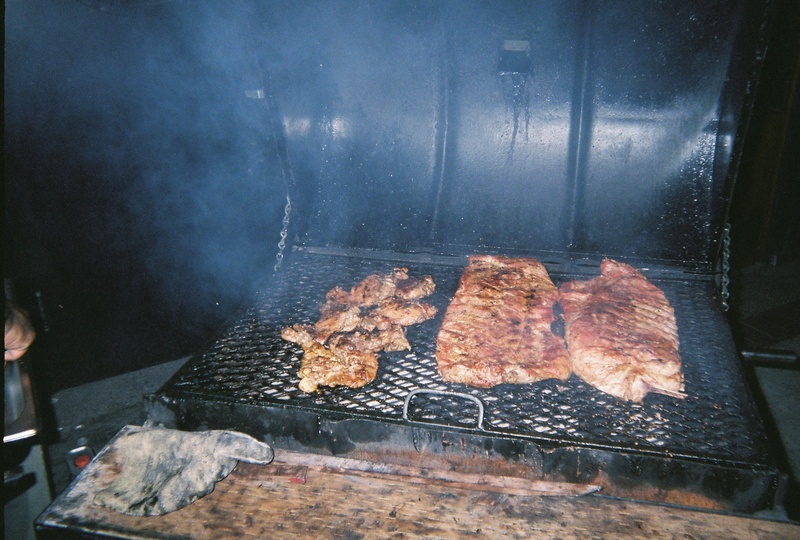 When the band took a break the singer and other musicians grabbed drinks and had some smokes with the audience outside as the club staff walked from table to table getting barbecue orders. An interesting end to our last night in Portland. The next day we’d be heading south to Eugene. The team was in Oregon for a couple of days as part of a quick trip through my old stomping grounds in the Beaver State. We had hoped to get a respite from the heat of a California summer but instead found ourselves in the midst of an Oregon heat wave. After settling in at our room at the rather forgettable downtown Hilton, I took a long walk through the city’s core. When I attended the University of Oregon, my time in Portland was spent either going to the airport or attending a conference or a job interview. I hadn’t spent much time as a tourist and the goal of this trip was to try and get a better sense of the city itself. As I wandered along I found that Portland had been suffering through the economic downturn. Streets in the once trendy Pearl District were lined by vacant storefronts and towering condos — built in the frenzied boom years — now stood dark and empty. There’s still a push by locals to “keep Portland weird” and retain their city’s eccentricities in the face of economic redevelopment and transplants from, gasp, California! The city is definitely weird, but it seems that local weirdness has been best protected by our protracted recession than the efforts of tattooed, homeless drug addicts. Continuing my walk through Stumptown, (Portland’s unofficial nickname) I was getting a little bummed by what seemed to have befallen the city I remembered as being so vibrant. Noticing some activity a few blocks over I headed in that direction and soon found myself in the Skidmore neighborhood Saturday market. Here was the vibrancy I had been missing. Hippies, hipsters, hoods, young parents and old folks all mingling in a mix of open-air craft stalls and food vendors. I could feel the unique, funky beat of the music of Portland and I liked it. I met up with Christine back at the hotel and we decided to cross the river and head over to the Hawthorne neighborhood, which is home to Apizza Scholls. A trendy but legendary pizzeria that proved to have some awesome pizza. They only allow you to choose three toppings for your pie — to retain the true pizza taste — and Christine and I opted for Nicoise olives, onions and home made sausage. The crust was light with a crisp texture and it had plenty of substance to give the rich toppings a strong foundation. The waiter challenged me to finish the last two pieces. He didn't need to challenge me my friends. Before we started our meal, I knew there'd be no leftovers. We chose a simple but eloquent Italian Barbera to pair with our pizza. Christine fell in love with the place and quickly declared it to be the best she had ever tasted. I equivocated a bit saying, “well there was this little place I found in Florence,” but she quickly called me on my pretentiousness and we agreed it was the best pizza we’d ever tasted. After pizza, we dropped by a cool looking night club that turned out to have some of the worst stand up comedy I’ve ever been subjected to and then crossed back over the river to downtown and our hotel. We’ve had some big developments in the past few weeks; The Uncorked Life is moving. If you’re a friend of the blog, I’m sure you’ve gathered that the team spends some time in Lodi and some time in Napa. Two great wine regions to live in, but the back and forth between the two has been a drain of time, money and our patience. Christine’s employer is in Napa, and mine was in Lodi. For the past three years, she’s worked and lived in Napa for most of the week and we spent the weekends in either Napa or Lodi. The arrangement worked for a while, but we both grew tired of the commuting and the scant free time we had together. Recently, my professional life came to a crossroads and I made the decision to pursue a new path. I’m leaving newspapers and will be joining a winery in Napa. It’s going to be a big change, this harvest I’ll be working as a winemaking and cellar intern. I’m ditching Docker kahkis for Carhart work pants. Instead of newspaper ink, my hands will be stained with grape juice. This will be the second harvest I have worked and I’m looking forward to the rush and excitement of grinding through the fall season. It was not an easy decision to leave the life of a newspaperman. I’ve been working in daily journalism since I was 18 and it became my professional identity. But it’s no secret that the industry is making the painful transition into a new world in which far fewer people read the print edition of newspapers. I like to say that 40 years ago six out of every 10 cars on the road were made by General Motors and everyone read newspapers. These days, GM ain’t doing too great and neither are newspapers, but people still need to drive and they still need the news. GM and newspapers just need to figure out how to be competitive. Wine has always been one of my other passions and as the newspaper industry undergoes its transition I took an opportunity to learn more about winemaking. I may pursue that as my next profession or maybe take up wine writing full time. I’m not sure, but I do know I’m going to keep living the uncorked life. So keep reading, it’s going to be interesting. Lodi recently hosted a bike race in which the winners were awarded six liter bottles of wine. I was chatting with our sports reporter about the event and she mentioned how she had never seen bottles so big. I told her there are even bigger bottles and that I believe the six liter bottle has its own name. A quick Google search brought up the whole list of the big boys. There are a few other bottle names depending on if it’s still or sparkling wine, but these are pretty much the varying sizes. Many of these big bottles were introduced by Champagne producers. But really, how cool would you be if you showed up at a party with a bottle like what these French guys are displaying? Liquor and doughnuts, like the punchline for a Homer Simpson joke. I never thought about mixing myself up a stiff cocktail and sitting down to a nice plate of doughnuts. Not even a breakfast eye opener like a Bloody Mary or Screwdriver sound remotely appealing paired with a doughnut. But in the tiny town of Lockeford, just outside Lodi, there’s a shop selling just that combination. About a year ago, the new owner of a bar put out a sign proudly proclaiming that liquor and doughnuts were to be had on the premises. A former colleague of mine at the paper included the shop in a story about odd business combinations. The store has a bar, two billiards tables and a display case for doughnuts. It still seems strange to me, but I bet you there’s some disenfranchised sous chef in New York or LA that’s trying to dream up the next hot culinary trend. He’s got it! Doughnuts and Liquor! I can just see it, a ginger infused vodka mixed with boysenberry juice and fresh sprigs of dill served straight up in a martini glass and paired with mini doughnuts with a maple and cinnamon glaze. Perhaps the next big culinary trend may really have its roots with an entrepreneur in Lockeford.